This exquisite silver cross votive candle holder will be an appropriate and cherished favor from your important religious event. 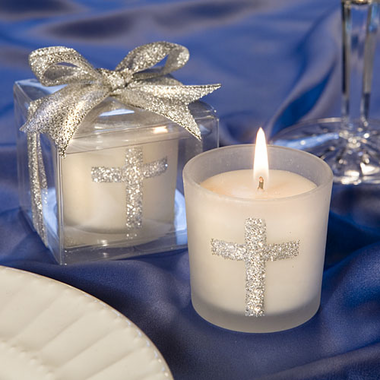 Each silver cross candle favor measures 2' x 1 2/4" and features a sturdy white frosted glass holder decorated with a sparkling silver cross design, with a white poured candle inside. Packaged with punch, these candles come ready for dramatic presentation inside a deluxe clear box topped with a sparkling silver bow.